The fun thing about making bread is that it is like the world's best Play Dough. You can mold it and shape it any way you want. These Soft Pretzels can be made into a variety of shapes. 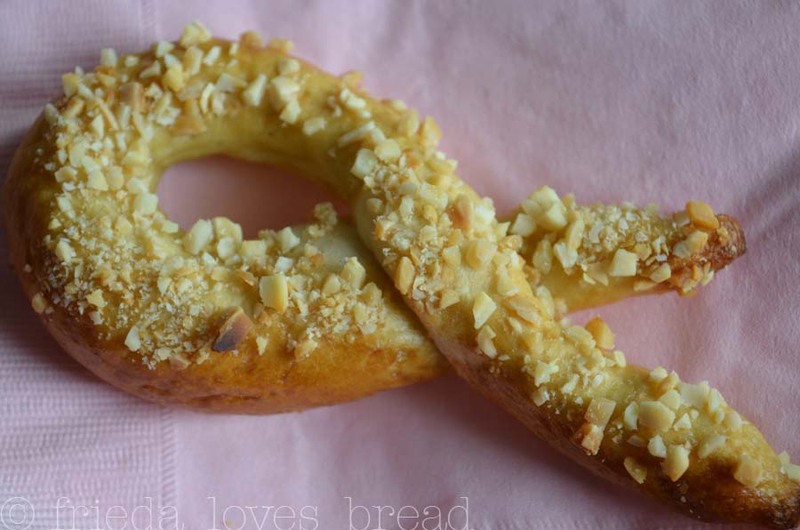 I dunked the egg washed pretzel into a pile of finely chopped almonds, giving it more crunch. These are even better dipped in Easy Caramel Sauce. A perfect combination of crunchy, chewy, and deliciously sweet. October is Breast Cancer Awareness month. Chances are, you know someone that has been touched by breast cancer. Perhaps it was yourself. My mother and my sister are both survivors of breast cancer and now a high school friend of mine is battling it. Go to the National Breast Cancer Awareness website to learn more about how you can help. If you click on this link, you will be directed in 31 ways to be involved and help support Susan G. Komen for the CureⓇ during this month. Frieda, these sound perfect. I've been looking around for ideas to make my friend who is going through surgery next week. I might have to make extra of the caramel sauce though. Hope you have a great weekend. This is such a fun idea. I've been wanting to make pretzels this may just be the motivation I need. 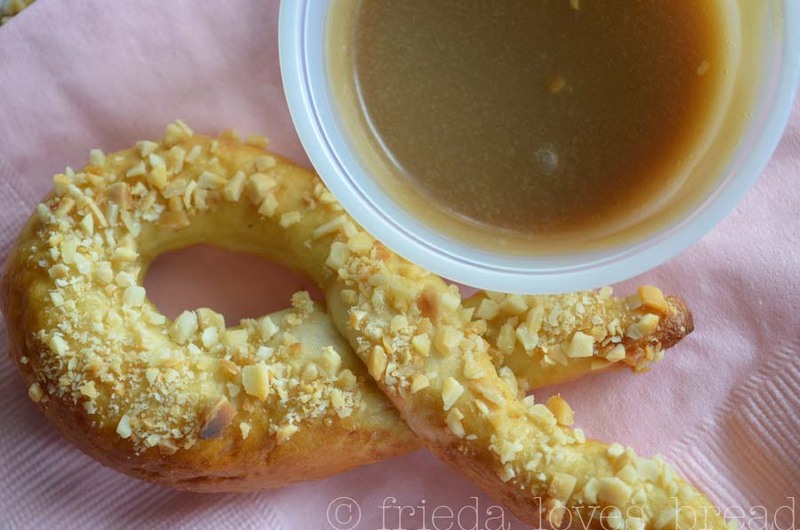 What a clever idea to dunk them in almond....and a lovely post! Mmm - soft pretzels. Delicious! Great idea for the almonds. Thanks for the reminder about breast cancer awareness. My aunt is also a survivor!